Jessica Hanson (left) and Shiu-Ming Cheer (right), attorneys from the National Immigration Law Center, talk to the community about DACA, raids, and legal rights. Photo by Lee Choo. In order to educate the public about the current political climate surrounding immigration, California State University, Northridge’s Educational Opportunity Program’s (EOP) Dreamers, Resources, Empowerment, Advocacy and Mentorship (DREAM) Center hosted a “Know Your Rights” session on Feb. 21 in the Aronstam Library. EOP, the DREAM Center, CSU Division of Student Affairs, CSUN Social Work Department, and CSUN College of Humanities collaborated with the National Immigration Law Center and Mayor Eric Garcetti’s Office of Immigrant Affairs to provide this workshop to the community. PLEASE NOTE: The information provided in this article is intended for informational purposes only and should not substitute for a lawyer. This information does not constitute legal advice. Anyone feeling the need for counsel should meet with an immigration lawyer, as everyone’s situations are unique and each situation requires analysis from many different perspectives. CSUN or NILC cannot be responsible if anyone relies on information based on this website without the consultation of an immigration attorney. Please be aware that immigration is a constantly evolving area of law and that anyone affected should consult an attorney to discuss specific facts and determine if any recent changes in laws and policies may affect that person. 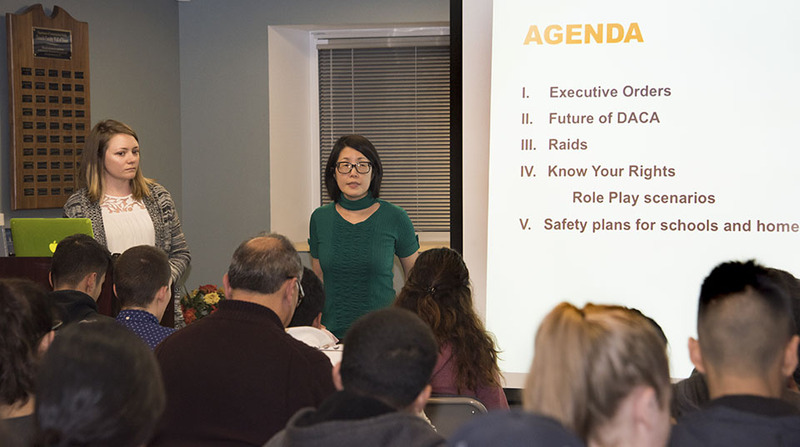 Attorneys Shiu-Ming Cheer and Jessica Hanson, from the National Immigration Law Center, gave a detailed presentation on Deferred Action for Childhood Arrivals (DACA), raids and legal rights. They started by making suggestions to those considering applying or reapplying for DACA. Cheer and Hanson also gave the audience information about what to do during an Immigration and Customs Enforcement raid. The attorneys emphasize the importance of keeping the door closed when ICE officers knock on the door of a household with undocumented immigrants. The last part of the presentation was in the title category, “Know Your Rights.” Cheer and Hanson outlined four legal rights and stated that everyone, no matter what their immigration status is, has these rights. If you would like a copy of the PowerPoint presentation given by the National Immigration Law Center, please email dreamcenter@csun.edu.